You might recognise the name Fiumicino – that’s because it’s the town the Rome airport was named after. (The name is, technically, the Leonardo Da Vinci-Fiumincino Airport if you were curious.) Fiumincino is actually a quaint fishing village – it was probably a very, very quiet place before the airport placed their massive petrol tanks along the shoreline. I say that in jest – in fact, the place still is very sleepy, home to a handful of bakeries, pizzerias, and B&Bs. After my recent trip to Umbria, I wasn’t going to be able to get back into Rome before my flight, so I had an overnight wait. Having dealt with the throngs of tourists in Rome many a time, I wasn’t up for the fight. I just wanted a place to relax, enjoy a glass of wine, and have a peaceful sleep. And that’s just what you’ll find in Fiumincio. 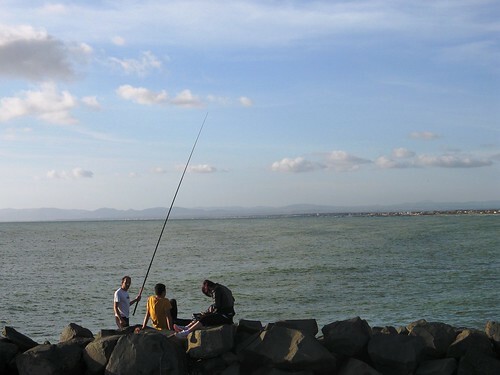 The prominent attraction in Fiumicino is the promenade on the pier. Lots of couples enjoy afternoon strolls even on a Monday – no doubt many taking advantage of the siesta period very popular in this part of town, judging by the Italian signs. This is still an active fishing community; when walking, we saw plenty of fisherman selling their wares. Although our pensione did have a kitchenette, that wasn’t exactly how I envisioned spending my evening! The streets were marvellously clean compared to their more urban Roman counterparts. The sea spray was fresh – in a packed Roman square on a hot day, you can all but forget that the city is not far from the sea. I couldn’t tell if these fisherman were fishing or just enjoying a cigarette with the view. Fiumincino offers bargain-basement prices as compared to the city centre in Rome – less than half the price, in some cases. Our B&B was set in a very rural, almost awkward, side street and the taxi driver had to circle a couple of times to find it. Up the narrow stairs we found a large room – unusual for Italy, to be honest – with a kitchenette, sitting table, and even a very spacious outdoor terrace overlooking the nearby houses, perfect for enjoying that glass of wine I mentioned earlier. However, I wouldn’t suggest basing yourself here if you plan on spending most of your time in Rome. You’ll be relying on the bus system, which is fine but not exactly the most tourist-friendly in these parts (if you speak some Italian, though, great!). The express train from the airport into town is a 10 minute taxi ride away, which can quickly negate any of your savings for being out here. What this place is perfect for: if you’ve seen the Trevi Fountain and the world famous chapels and catacombs, if you’ve been travelling elsewhere and are ready to have a bit of a break before your flight. You’ll have no trouble finding a hotel online, but I do suggest catching a taxi from the airport or train station – some hotels offer shuttles for around 10EUR, but it was less than 15EUR from the airport to our hotel. 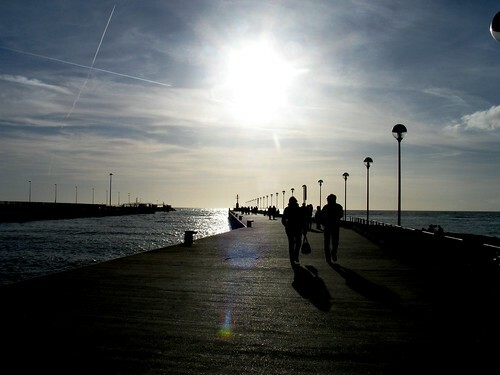 Oh, and most importantly – right off the main pier, heading away from the sea, you’ll find everything else you need – fresh calamari, pizza, pastries, and that tasty glass of wine.